Our breeding pair 19 / 2019 is updated at our web page and consist two new added One loft Racers from 2018. 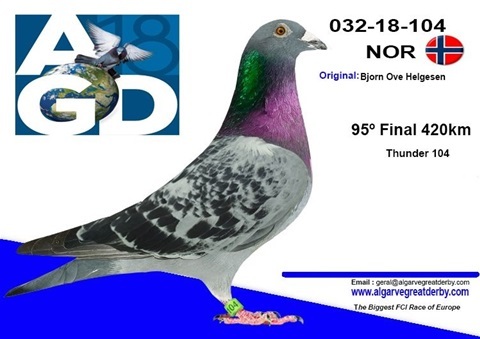 The sire «Thunder 104» is from our own loft Helgesen Racing Pigeons, and this bird won a 95th prize at the Algarve Great Derby Final 2018 (1.244 birds - 414km). The hen «Sister FCI Winner» is full sister MIRA FCI winner 2017 from Martin Sævareid. Father of this nice hen is from our own loft Helgesen Racing Pigeons, and is a son of «Son Pokerface» in PAIR 01 / 2019.